Proton therapy is a cancer treatment technique as are surgery and chemotherapy. Proton therapy is a radiotherapy technique. It can be used alone or in combination with surgery and chemotherapy, depending on the type of cancer. Generally radiation therapy is a technique that involves using ionizing radiation to treat cancers. 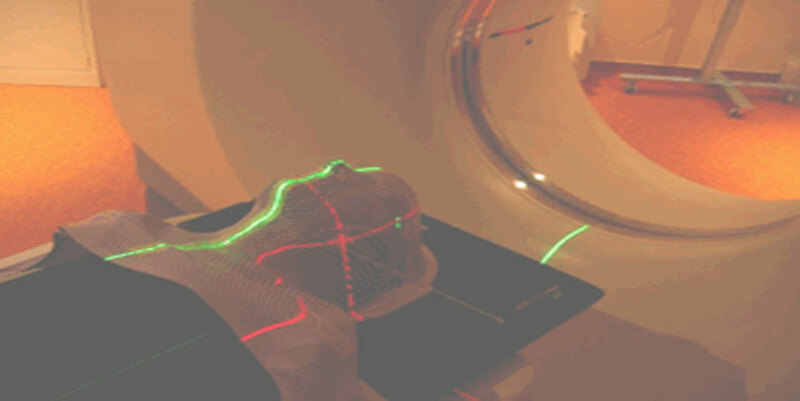 The patient is placed in a machine that will deliver the radiation at the desired localization. During a radiotherapy session, when delivering radiations, the patient does not feel anything, just like during a radiological examination (CT, MRI, X-ray). The symptoms related to radiation appear after a few days and are mild to moderate intensity. Depending on circumstances, it may be that radiation causes significant symptoms that are predictable; they can be anticipated and cured without sequelae most of the time. In recent decades, radiotherapy techniques have improved significantly allowing to cure cancer while constantly decreasing toxicities, notably the use of proton particles (known as protontherapy) instead of photon or electrons. The diagram above shows the delivery of energy (irradiation) by type of particle (electrons, photons or protons). Beyond the maximum energy deposition for protons, there is complete disappearance of irradiation, unlike electrons and photons. The profile of the dose deposition therefore describes a peak called “Bragg peak”. 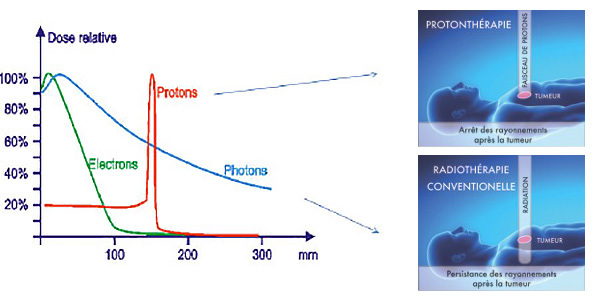 The maximum dose is deposited in the tumor: thanks to their physical properties, the protons will not irradiate beyond the tumor (top right), unlike more conventional particles (bottom right). It is not very different than another radiation treatment. It begins with the consultation with the radiation oncologist (medical doctor that takes care of the radiation treatment) then the virtual computer simulated treatment is made. The case is discussed in a meeting with other doctors to validate or not the indication for proton therapy. A simulation CT is performed to collect the images on which the zones to treat and to avoid will be delineated. A mask is sometimes used to immobilize head lesions as to always treat them in the same position. For other targets (in the chest or abdomen, for example) we resort to a tattoo the size of a mole. Using these tattoos or marks on the mask, lasers are used to reposition to be able to readjust perfectly on the treatment area by positioning these lasers. A consultation will be held in Nice and / or in the city of origin to prescribe chemotherapy if indicated during radiotherapy. The simulation CT does not aim to aid diagnosis but only to acquire images of the lesion in treatment position as to better simulate the treatment on the computer. For target lesions of the head and neck, a plastic mask on your face will be affixed to mold perfectly the mask as shown in the previous image. It will harden in seconds and will keep the shape of your face which will permit to always treat you in the same position. For other lesions (chest, abdomen, pelvis, arms or legs) mattresses will be perfectly molded to your body, as to always treat you in the same position. Reference points the size of a mole will be tattooed on your skin close to your lesions, as well as on your right and left as to always place you in the same position as in the simulation CT. In some clinical situations quality imaging (MRI, PET-CT and 18-FDG issued less than a month, CT with contrast injection) will be required to achieve the treatment plan. These exams may be conducted in the city of origin or in Nice. Irradiation beams are positioned on a computer and the best position of these beams will be simulated in order to target a maximum of the lesion while avoiding as much as possible the healthy tissue. This simulation will begin once all the lesions and healthy tissues are delineated by the radiation oncologist. The calculation requires a period of 7 days. Once the treatment is planned and finalized, irradiation sessions can begin. Patients in the Alpes-Maritimes region will come from their homes by their own means or by other means of transport if necessary. Patients from other regions can benefit from accommodation close to the proton therapy center, “La Consolata”. It is an accommodation structure owned by the Antoine Lacassagne Centre to accommodate patients and their companions from around the world. Consolata is located on the hills of Nice, a few minutes from the Mediterranean Institute of Protontherapy in a setting that is both quiet and relaxing, with a panoramic view of the Bay of Angels. As with any radiation therapy, patients will be seen at least once a week by a radiation oncologist to note all the side effects. They will also be seen on demand in case of problems. For children, with the Pediatric Hospital of Nice Lenval Hospital, specialized in surgery, Archet Hospital with its Oncology-Hematology Ward and the Centre Antoine Lacassagne, Nice’s radiotherapy pole- only establishment authorized in the Nice territory to treat with radiation therapy both adults and children – the Nice area can propose a comprehensive care network for children with cancer. Proton therapy is not always suitable for all situations because it is not all the time necessary to use the precision of this technique as conventional radiation techniques allow more often to treat tumors in excellent conditions. However, in certain clinical situations, the use of proton therapy reduces the toxicities that occur during irradiation but also the very long term toxicities (intellectual disorders, stroke, radiation-induced cancer, hormone deficiencies, etc. …). Proton therapy is used primarily to reduce the complications of radiotherapy. – Radioresistant paraspinal or pelvic tumors. → some doubt exists as to the ability of proton therapy to deliver the dose more accurately; in such cases the 2 treatments will be compared virtually to see which is best.